It’s time for another edition of … Update Your Plate! Last week, I introduced MyPlate, USDA’s newest healthy eating guide. 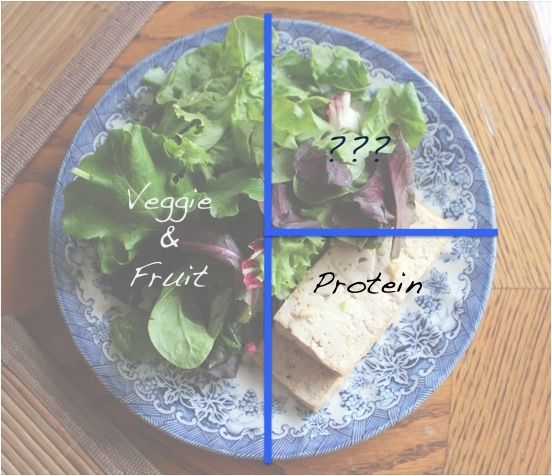 I’ve been using a system similar to MyPlate for several years to help me balance my meals and to ensure I’m getting enough vegetables, protein, etc. to keep me nourished. 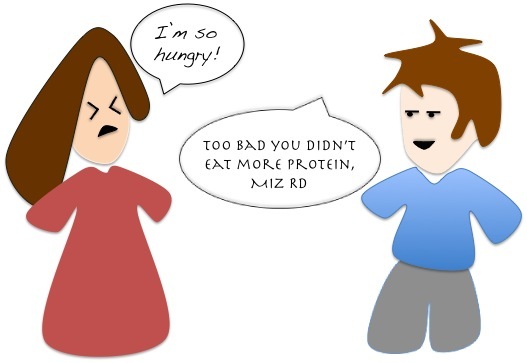 The best way to demonstrate how MyPlate works is through examples. Modeling, baby! We’ve got our Veggie & Fruit plate half (although there’s not a heck of a lot of variety there), and we’ve got our Lean Protein (although it’s a little skimpy for a full-grown Happy Jessie). But wait! What are those question marks doing there? Where’s our Grains/Starch? Something I encounter a lot is people skimping at breakfast and/or lunch, often because they are busy or they are looking to cut back on calories. I’ve known people who skimp for years. Those same people sometimes struggle with lack of energy and/or controlling their weight, or just have the feeling that something “isn’t right”. Just like cars, pets, plants, and everything else we lavish attention on, our bodies need fuel to run properly. Let’s extend the same courtesy to ourselves. Thanks for the reminder, Peter. Incidentally, I tried to give Peter a tough-sounding font for his speaking voice so I chose one called “Herculanum” … but then again, I somehow drew him wearing M.C. Hammer pants. I’m hoping the two will cancel each other out. Also, Peter does not have a mullet. Anyway, how could we make this meal more filling and nutritious? 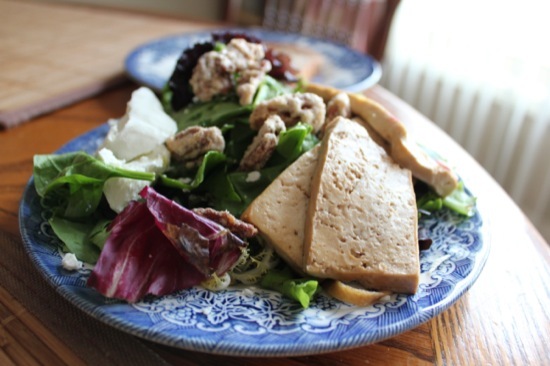 Let’s throw on some more marinated tofu, some goat cheese, some of my famous (to me) sweet pecans, and a drizzle of olive oil (love those healthy fats — they help us absorb the nutrients in vegetables, too). This salad would be even better if I had other veggies to throw on top, like tomatoes or broccoli. Looks like we need to go grocery shopping! I also added a slice of whole grain cinnamon raisin bread, because YUM. And the whole grain part. After I took this picture, I toasted the bread and added a dab of butter on top. Notice I didn’t lay this meal out like MyPlate. At this point, I have a pretty good eye for portion sizes and food proportions. With practice, you can be as awesome as I am. Who wouldn’t feel more satisfied with this meal? Balanced, packed with nutrients, and less likely to leave me reaching for a snack in one hour. Score! 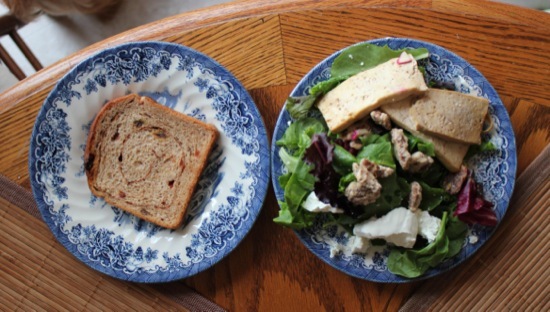 Q: C’mon, admit it: who’s eaten a meal that looks like the first picture? *raises hand* How did you feel afterward? I never thought to use tofu in salads. What a great idea.